Programmed graph reduction has been shown to be an efficient implementation technique for lazy functional languages on sequential machines. Considering programmed graph reduction as a generalization of conventional environment-based implementations where the activation records are allocated in a graph instead of on a stack it becomes very easy to use this technique for the execution of functional programs in a parallel machine with distributed memory. 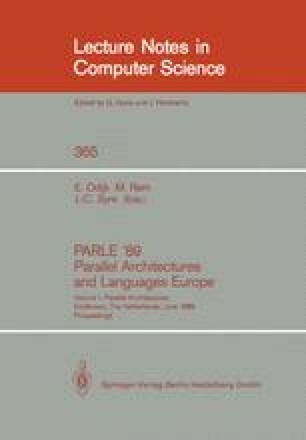 We describe in this paper the realization of programmed graph reduction in PAM — a parallel abstract machine with distributed memory. Results of our implementation of PAM on an Occam-Transputersystem are given.